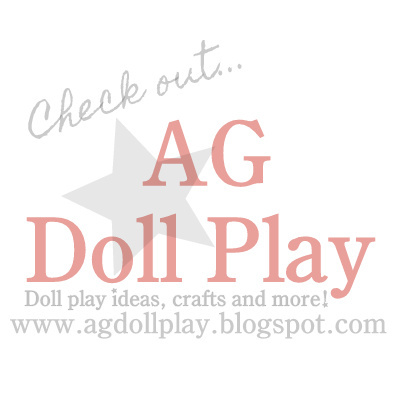 American Girl Doll Play: Happy Birthday Rebecca!!! It's Rebecca's birthday today!!! Happy birthday sweet Rebecca! Our Rebecca came to us from eBay and she was a super deal and I have to say that I am so thankful for that purchase! Rebecca is my doll (this is Jen talking here) and she's my only. Zoey thinks she looks like me and is my look alike. :) That is Zoey being sweet. Anyways, Rebecca celebrated her birthday with McKenna and her good friend Kristen this year. She doesn't like big and loud, fancy parties (kind of like me). She likes quiet and calm...and definitely enjoys sweet treats! Again, kind of like me I guess. She chose to wear her Doll Diaries shirt today as well since she LOVES Doll Diaries and thinks she just might get lucky and have her photo on their site today since it's her special day. That would just make her day all the more special and pretty much perfect! Her friends got her a special birthday crown to wear for her special day, here she is getting ready to enjoy a vanilla cupcake with strawberry frosting. Mmmmm! A special time with special friends! Rebecca feels so loved and so very lucky to have such special and thoughtful friends as these to help make her day all the more special. Good friends, even if just two...it doesn't matter how many, are what makes her heart happy. She is so blessed to have some really close pals to call her own. Happy birthday to our sweet Rebecca girl! We love you! It looks like Rebecca got her birthday wish! She is a star at Doll Diaries today, too! I just love this photo and your Rebecca is gorgeous! We can't let the kids have all the fun - Moms need dolls, too. Thanks again for sending over the photos of Rebecca and being such an awesome part of the doll community! Thanks so much Char! You truly have been the catalyst for this site and so much of this doll fun and we just love, love, LOVE Doll Diaries! :) Rebecca is beyond happy to be on your site, today of all days! Enjoy your day today!!! I saw Becca on doll diaries! Happy b-day Becca! You are an awesome doll! I have her and love her! Thanks Sierra! We love our Becca too! WHERE DID YOU GET that butterfly blue outfit???!!!! That is a Dollie & Me outfit!! :) We found it on Zulilly a couple of weeks ago now.